Risk-related information (like the prevalence of conditions and the sensitivity and specificity of diagnostic tests or treatment decisions) can be expressed in terms of probabilities or frequencies. By providing a toolbox of methods and metrics, 'riskyr' computes, translates, and visualizes risk-related information in a variety of ways. Offering multiple complementary perspectives on the interplay between key parameters renders teaching and training of risk literacy more transparent. Risk-related information — like the prevalence of conditions and the sensitivity and specificity of diagnostic tests or treatment decisions — can be expressed in terms of probabilities or frequencies. By providing a toolbox of methods and metrics, riskyr computes, translates, and visualizes risk-related information in a variety of ways. Offering multiple complementary perspectives on the interplay between key parameters renders teaching and training of risk literacy more transparent. The goals of riskyr are less of a computational and more of a representational nature: We express risk-related information in multiple formats, facilitate the translation between them, and provide a variety of attractive visualizations that emphasize different aspects of risk-related scenarios. Whereas people find it difficult to understand and compute information expressed in terms of probabilities, the same information is easier to understand and compute when expressed in terms of frequencies (e.g., Gigerenzer, 2002, 2014; Gigerenzer & Hoffrage, 1995). But rather than just expressing probabilities in terms of frequencies, riskyr allows translating between formats and illustrates the relationships between different representations in a variety of ways. Switching between and interacting with different representations fosters transparency and boosts human understanding of risk-related information. Effective training in risk literacy requires transparent representations, smart strategies, and simple tools. We aim to provide a set of (computational and representational) tools that facilitate various calculations, translations between formats, and a range of alternative views on the interplay between probabilities and frequencies. Just as no single tool fits all tasks, no single graph illustrates all aspects of a problem. A variety of visualizations that illustrate the interplay of parameters and metrics can facilitate active and explorative learning. It is particularly helpful to view relationships from alternative perspectives and to observe the change of one parameter as a function of others. Based on these assumptions and goals, we provide a range of computational and representational tools. Importantly, the objects and functions in the riskyr toolbox are not isolated, but complement, explain, and support each other. All functions and visualizations can also be used separately and explored interactively, providing immediate feedback on the effect of changes in parameter values. By providing a variety of customization options, users can explore and design representations of risk-related information that suit their personal needs and goals. An interactive online version is available at http://riskyr.org. About 4% of the people of the general population suffer from hustosis. If someone suffers from hustosis, there is a chance of 80% that he or she will test positively for the condition. If someone is free from hustosis, there is a chance of 5% that he or she will still test positively for the condition. Mr. Smith tested positively (i.e., received a diagnosis of hustosis). Ms. Smith tested negatively (i.e., was judged to be free of hustosis). What is the probability that Mr. Smith actually suffers from hustosis? What is the probability that Ms. Smith is actually free of hustosis? The condition's prevalence (in the general population) is 4%: prev = .04. The device's or diagnostic decision's sensitivity is 80%: sens = .80. The device's or diagnostic decision's false alarm rate is 5%: fart = .05, implying a specificity of (100% − 5%) = 95%: spec = .95.
aka. the positive predictive value (PPV). aka. the negative predictive value (NPV). What proportion of individuals with a positive test result actually suffer from hustosis? What proportion of individuals with a negative test result are actually free of hustosis? By providing the argument N = 1000 we define the scenario for a target population of 1000 people. If we leave this parameter unspecified (or NA), riskyr will automatically pick a suitable value of N.
The conditional probability that Mr. Smith actually suffers from hustosis given his positive test result is 40% (as PPV = 0.400). The conditional probability that Ms. Smith is actually free of hustosis given her negative test result is 99.1% (as NPV = 0.991). all.equal(hustosis, hustosis_2)  # do both contain the same information? Various visualizations of riskyr scenarios can be created by a range of plotting functions. by accuracy (by = "ac"), to split the population into correct vs. incorrect (dec_cor vs. dec_err) decisions. The proportion of individuals with a positive test result who actually suffer from hustosis is the frequency of "true positive" cases (shown in darker green) divided by "decision positive" cases (shown in purple): 32/80 = .400 (corresponding to our value of PPV above). The proportion of individuals with a negative test result who are actually free from hustosis is the frequency of "true negative" cases (shown in lighter green) divided by "decision negative" cases (shown in blue): 912/920 = .991 (corresponding to our value of NPV above, except for minimal differences due to rounding). Of course, the frequencies of these ratios were already contained in the hustosis summary above. But the representation in the form of a tree diagram makes it easier to understand the decomposition of the population into subgroups and to see which frequencies are required to answer a particular question. While this particular icon array is highly regular (as both the icons and classification types are ordered), riskyr provides many different versions of this type of graph. This allows viewing the probability of diagnostic outcomes as either frequency, area, or density (see ?plot_icons for details and examples). The L-shape of this plane reveals a real problem with our current test: Given a prevalence of 4% for hustosis in our target population, the PPV remains very low for the majority of the possible range of sensitivity and specificity values. To achieve a high PPV, the key requirement for our test is an extremely high specificity. Although our current specificity value of 95% (spec = .95) may sound pretty good, it is still not high enough to yield a PPV beyond 40%. As defining your own scenarios can be cumbersome and the literature is full of risk-related problems (often referred to as "Bayesian reasoning"), riskyr provides a set of — currently 24 — pre-defined scenarios (stored in a list scenarios). Here, we provide an example that shows how you can select and explore them. #>  "Male patients with symptoms"
#>  "Arkes, H. R., & Gaissmaier, W. (2012). Psychological research and the prostate-cancer screening controversy. Psychological Science, 23(6), 547--553." Generating some riskyr plots allows a quick visual exploration of the scenario. We only illustrate some selected plots and options here, and trust that you will play with and explore the rest for yourself. Adding the argument what = "all" also shows the proportion of positive decisions (ppod) and the decision's overall accuracy (accu) as a function of the prevalence (prev). Would you have predicted their shape without seeing this graph? Hopefully, this brief overview managed to whet your appetite for visual exploration. If so, call riskyr.guide() for viewing the package vignettes and obtaining additional information. Email us at [email protected] if you want to modify or share this software. Simon, H.A. (1996). The Sciences of the Artificial (3rd ed.). The MIT Press, Cambridge, MA. (p. 132). See Gigerenzer (2002, 2014), Gigerenzer and Hoffrage, U. (1995), Gigerenzer et al. (2007), and Hoffrage et al. (2015) for scientific background information and similar problems. See Sedlmeier and Gigerenzer (2001) and Kurzenhäuser and Hoffrage (2002) for related training programs (with remarkable results), and Micallef et al. (2012) and Khan et al. (2015) for (rather sceptical and somewhat sobering) studies on the potential benefits of static representations for solving Bayesian problems. See Gigerenzer and Hoffrage (1995) and Hoffrage et al. (2000, 2002) on the concept of natural frequencies. The current development version is available at https://github.com/hneth/riskyr/. riskyr 0.2.0 was ready to be released on December 20, 2018, and submitted to CRAN on January 02, 2019. To use selected riskyr functions without the need for coding an updated version of riskyrApp is available at https://github.com/hneth/riskyrApp (R Shiny code) and at http://riskyr.org (interactive online version). Provide package documentation online at https://hneth.github.io/riskyr (latest release version) and https://hneth.github.io/riskyr/dev/ (current development version). The functions plot_fnet and plot_tree are replaced by plot_prism, and plot_mosaic is replaced by plot_area. This improves functionality (e.g., by providing more consistent options across different plotting functions) and removes dependencies on external packages. Show a scenario as double frequency tree (by 3 x 2 perspectives) or a frequency tree (in 3 perspectives) with many additional options; replaces the older plot_fnet and plot_tree functions (and removes dependency on the diagram package). Show a scenario as a mosaic plot of relative proportions (in 3 x 2 x 2 possible versions, with many additional options); replaces the older plot_mosaic function (and removes dependencies on the grid and vcd packages). Show a scenario as contingency table of frequencies (with row and column sums, and options for showing probabilities); a variant of plot_area that does not scale area sizes. Show scenario frequencies as vertical bars (in various configurations). Define a new box object type and various functions for plotting, labeling, and linking them in graphs (to remove dependencies on and limitations imposed by other packages). As an alternative to providing 3 essential frequencies, it is now possible to define a scenario from 4 essential frequencies (and check for consistency with given probabilities). Show icons separated into 2 subsets by 3 perspectives (condition, decision, accuracy), using the same by argument as the other plotting functions. Update variable names (to snake_case) and add arguments (e.g., col_pal, lbl_txt mar_notes, etc.) for consistency with newer plotting functions. The new plotting functions feature a scale argument that allows scaling the size or areas of boxes either by (exact) probability or by (possibly rounded) frequency. When using scale = "f", the probabilities shown are also re-computed from (possibly rounded) frequencies. Change argument box.cex to cex.lbl to ensure consistency with plot_curves and plot_plane (and use it to scale arrow labels accordingly). Added warning when using deprecated argument. Change Boolean vsplit argument to by = "cd" vs. by = "dc" to ensure consistency with plot_fnet and plot_tree. Added warning when using deprecated argument. Use consistent plot margins and options for showing margin notes for all plots. Read a data frame popu and interpret is as a riskyr scenario, allows creating scenarios from raw data. Compute exact accuracy values (not approximations, when using comp_accu_freq on rounded freq values) by using the new function comp_accu_prob to compute the list accu from probabilities. Signal rounding when showing accuracy based on rounded frequencies in plots (when show.accu == TRUE and round == TRUE). Use more consistent color and frequency names (e.g., cond_true, dec_pos, and dec_cor are now names of frequencies and the colors corresponding to these frequencies). Add a 3rd perspective (by accuracy or by correspondence of decision to condition) and corresponding frequency pair of dec.cor and dec.err (i.e., hi + cr vs. mi + fa as the diagonal of 4 SDT cases). This increases the number of frequencies in freq from 9 to 11. Also added corresponding labels in init_txt.R and colors in init_pal.R. Include accuracy metrics in probabilities (in prob and summary functions). Add multiple color palettes and text labeling schemes (see ?pal and ?txt for details). More consistent argument and variable names (using snake_case). Many additions and corrections in documentation, examples, and vignettes. Bug fix to also swap symbols in legend when the symbol order is changed manually. Simplify some default text labels (e.g., for current population, condition, and decision). 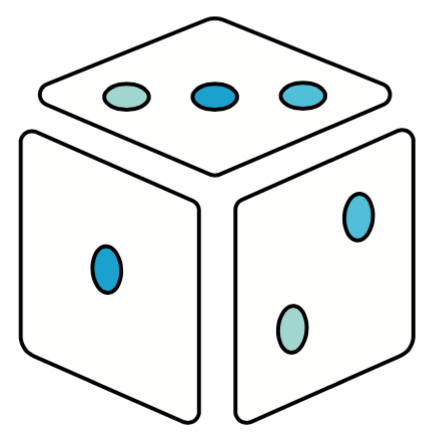 Cast dice to display probabilistic (i.e., risk-related) start-up messages.